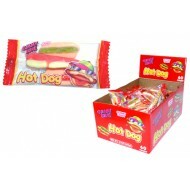 Display box contains 60 packs of Gummy Hot Dogs Candy. .. 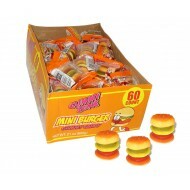 Display box includes 60 packs of Mini Gummy Cheeseburgers Candy. 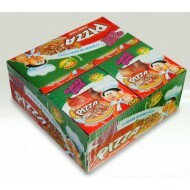 ..
Gummy Zone Pizza. 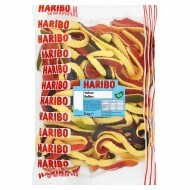 6 slices in every pizza, with added fruit juice , gummy candy fruit flavour pizza ..
Haribo Yellow Bellies - 3kg Bags Ingredients: Glucose Syrup, Sugar, Dextrose, Gelatine, Acid; E..
Sweet Victorian 1 Large Jar of Jelly mixed Fruit Flavour Gums party sweets 1.7 KG. 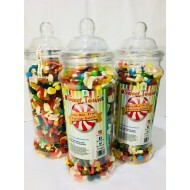 This jar contains..
Pencil Jelly is another tasty, innovative and extremely popular product. It's a ready to eat jelly..